At the age of 26, Karl Marx (August Diehl; INGLOURIOUS BASTERDS, THE COUNTERFEITERS) embarks with his wife Jenny (Vicky Krieps; PHANTOM THREAD) on the road to exile. 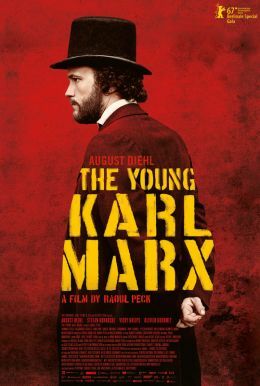 In 1844 Paris they meet young Friedrich Engels (Stefan Konarske), son of a factory owner and an astute student of the English proletariat class. Engels brings Marx the missing piece to the puzzle that composes his new vision of the world. Together, between censorship and police raids, riots and political upheavals, they will preside over the birth of the labor movement, which until then had been mostly makeshift and unorganized. This will grow into the most complete theoretical and political transformation of the world since the Renaissance – driven, against all expectations, by two brilliant, insolent and sharp-witted young men.